Thomas S. Monson with his daugher Ann Dibb. Thomas S. Monson, president and prophet of The Church of Jesus Christ of Latter-day Saints, died Tuesday night at the age of 90. In a statement, church spokesman Eric Hawkins wrote that Monson died at 10:01 pm in his home in Salt Lake City surrounded by family. 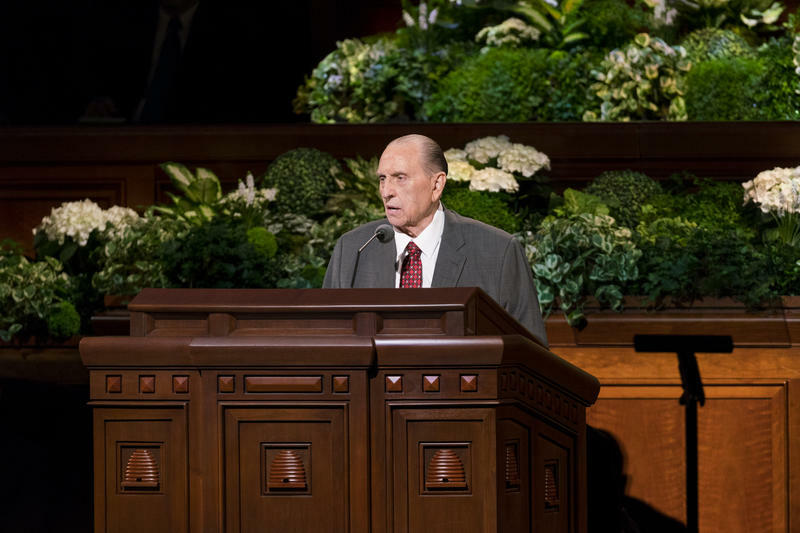 Monson had been at the helm of the 16-million member Mormon church for nearly a decade and will be remembered as much for his personal ministry as for his aversion to grand pronouncements. President Monson was a storyteller. Many of his stories involved following an inner prompting from the Holy Spirit. “On one occasion many years ago I was swimming laps at the old Deseret Gym in Salt Lake City when I felt the inspiration to go to the University Hospital to visit a good friend of mine," said Monson during the October 2012 General Conference. A native of Salt Lake, many of his anecdotes took place here. Whether that was visiting the 80 widows that lived in his downtown congregation as a young bishop. Or, as with this story, dropping in to see someone at just the right time. 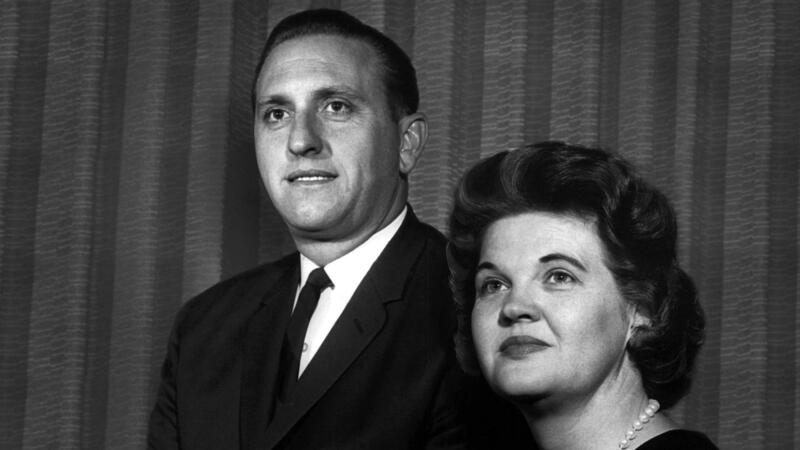 Thomas S. Monson with his wife Francis in 1965, two years after his call to be an apostle. Monson was a young man, only 36, when called to be a full-time apostle for the church, the second highest governing body. That would be unheard of today. “He really spent most of his life serving in the church," says William Walker, a former general authority for the church who worked closely with Monson for many years. 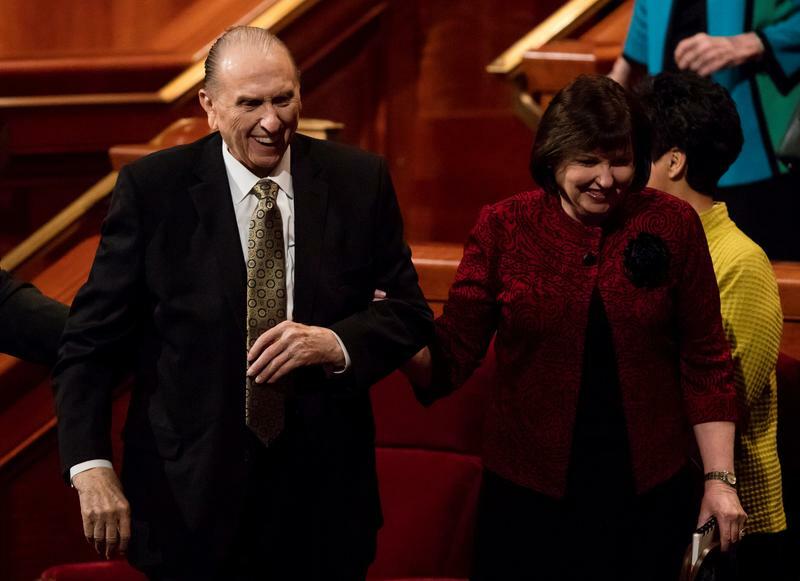 Walker and Monson would often travel together on assignment and during those trips, he says, Monson would always make time to meet and shake hands with as many church members as he could. Walker remembers one time in particular when Monson had just spoken to a large gathering. Following the closing prayer, he leaned over to the church leader and said, “If we slip out the side door, I can get you back to the hotel very quickly and get you some rest." Monson looked at him and responded, "If Jesus was here, do you think he would slip out the side door?" Walker decided to never make that suggestion again. On church practice and policy, Monson didn’t seem to have much of an agenda. He was a traditionalist. “I often heard him refer to the previous leaders of the church and he wanted to follow precedent," says Walker. One big change he will be remembered for is lowering the age for full-time missionary service. Women are now able to serve at age 19 instead of 21. This change led to a dramatic increase in the number of missionaries serving worldwide. But in recent years, Monson had scaled back public appearances and speeches. His health was declining and was reportedly suffering from memory loss. Monson’s ill health came at an inopportune moment for the church. “I feel like in the almost 10 years that he’s been president, it’s been a time of real turmoil for the church," says Kristine Haglund, a Mormon writer and former editor of Dialogue magazine. Haglund points to one time in particular as a stress point for church members. In November 2015, the church declared that the children of gay couples could no longer be baptized. It was a shock for many, confusing for most and seemed to contradict a growing acceptance of LGBT Mormons. But most confusing of all was that Monson was nowhere to be found. He said nothing publicly about the decision. "It wasn’t controversial to suggest that President Monson wasn’t necessarily in charge," says Haglund. Haglund says that as Monson became less and less involved in church governance, it wasn’t clear who was steering decisions like this one. He also remained quiet during a movement to ordain women that gained national attention. During the nine years he served at the head of the church, Monson only held one press conference soon after he was called. So, much of what he felt or thought about current issues was left entirely to speculation. 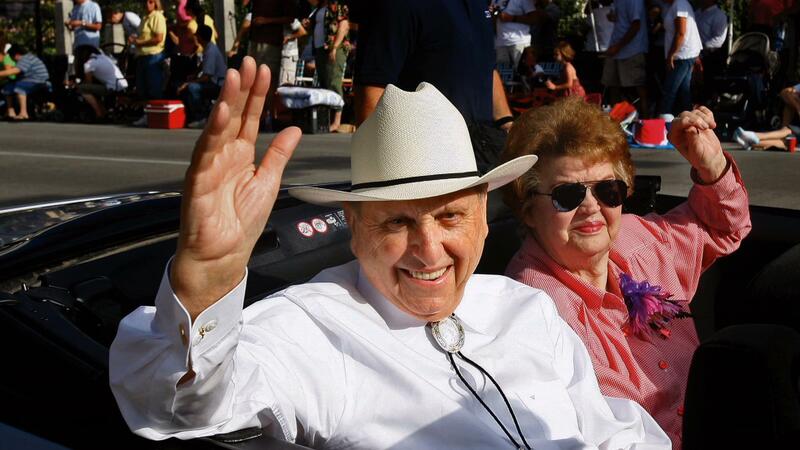 Monson and his wife Francis in a Pioneer Day parade, 2006. For some, the past few years have been uncertain times. 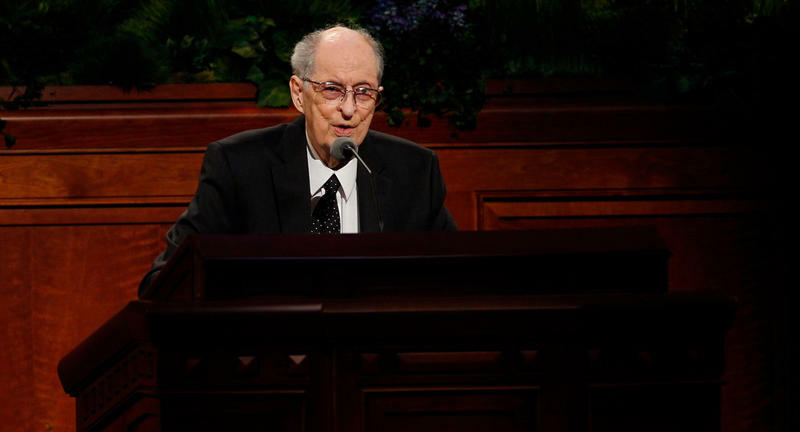 But Haglund says that’s the price of having leaders who serve for life and this likely won’t be the last time a Mormon prophet retreats during their final years. “We have to get used to this kind of leaderlessness, or at least the diluted sense of a leader’s presence," Haglund says. As for who will take Monson’s place, that has yet to be announced. A successor will not be chosen until after his funeral, a spokesman said. But tradition is that the senior-most church apostle is called to be the next president. In this case, Russell M. Nelson, a former heart surgeon, who at 93 seems to be in good health. This weekend The Church of Jesus Christ of Latter-day Saints will hold the twice yearly General Conference in Salt Lake City without the presiding leader Thomas S. Monson in attendance. Elder Robert D. Hales died Sunday afternoon from causes incident to age, according to a statement from the LDS Church. He was in the hospital surrounded by his wife and family.